This week I have been listening to The Handmaid’s Tale, by Margaret Atwood, and the line above really struck home with me. I have them, too, these attacks of the past. And I’ve been having them a lot recently because this is a significant year for me. It has been 50 years since my year as an exchange student to Argentina, a year that had a profound effect on the rest of my life. And since my father kept every letter I wrote home during that year, I have words from my younger self, as well as many memories, to help me revisit that experience. I hope to share some of that with you, if I may. 50 years ago today, my hurried preparations were complete for spending a year abroad. In the 3 week period between receiving my acceptance letter and my departure, I got my passport and required shots, was tutored by the Spanish teacher at my high school (since I’d had five years of French, but no Spanish training), put together a wardrobe that I hoped would work for the year, and was almost finished packing it all into one large suitcase. I said goodbye to my school friends who would graduate before I returned. I had just turned eighteen years old and the longest I had ever been away from home was two weeks at Girl Scout camp. But I was over the moon with excitement and ready to take on the world! I wrote these words about my departure for Argentina in a post I published here in 2008. 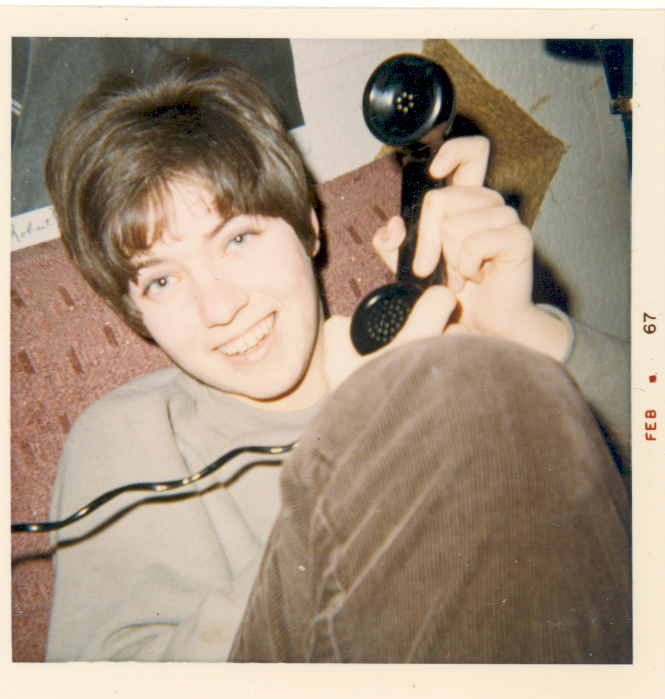 In early 1967, I was chosen to be an exchange student with the American Field Service (now known as AFS Intercultural Programs). Looking back, I realize that the year I spent in Argentina was a “pivot point” in my life — that point where I stood still, poised to move in one direction or another. 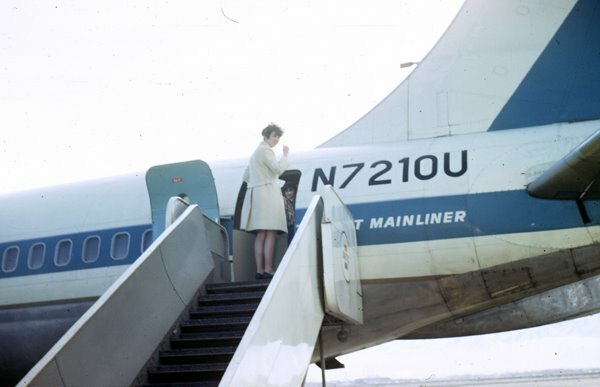 A photograph of me, at age 18, was snapped at the moment I hesitated at the top of the stairs while boarding the airplane to Argentina, looked back over my shoulder, and then began the forward motion of my life. This entry was posted in Argentina, Life, Memories on February 12, 2017 by Robin. What a thrilling time in your young life! Les, it really was thrilling for me… but I had no idea at that point in time what it would mean to be thousands of miles away from my family for a year! I was so very young! I love your hair in the phone picture! Robin, thanks for sharing this with us. It’s a delight. Kay, a real ’60s hairdo!! And I can’t believe how much time I spent on that old telephone! Ha!